Item # 312243 Stash Points: 3,095 (?) This is the number of points you get in The Zumiez Stash for purchasing this item. Stash points are redeemable for exclusive rewards only available to Zumiez Stash members. To redeem your points check out the rewards catalog on thestash.zumiez.com. Spruce up your living space with the Society6 Can't Slow Down Wall Clock. This 10" diameter clock features a plexiglass case and overall wooden construction to tie together your home decor with old school tattoo inspired style. 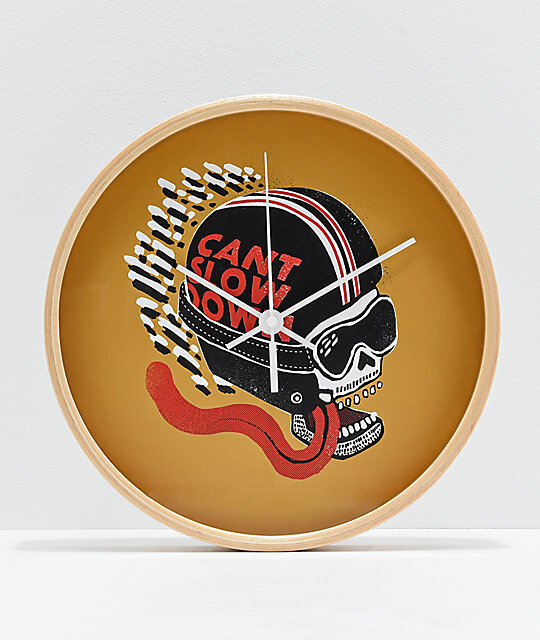 Can't Slow Down Wall Clock from Society6. Signature artwork by Landon Sheely.